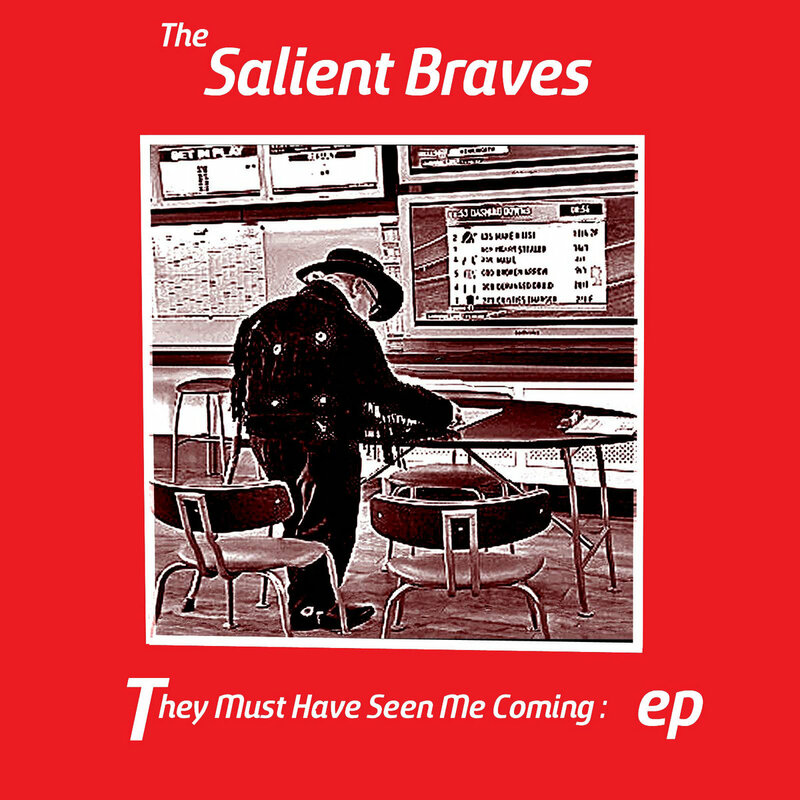 The brave and ever salient The Salient Braves are back, and it has been too long. When we last heard from the Barnsley, UK project headed by songwriter Matt Bailey it was October 13, 2013 and we were reviewing their fine Someplace Sordid EP (link). Today, they present They Must Have Seen Me Coming EP on Broken Down Records. As was the case with the previous EP, the record starts out with a perfect slice of guitar pop. And as in 2013, it is the title track leading the way and winning the listener's heart. Beginning with the inquiry "Have you ever seen a grown man cry? ", the jangling guitars and jaunty arrangement pull us in to our hero's lament. You just can't stop listening after a song like this one. Two more original songs, "The Great Unwashed" and "Odd Couple" follow. In my view, while the presentation changes to a more pensive mood and lower tempo, the quality doesn't lessen a bit. "Odd Couple", in particular sneaks up on you and hits you squarely; a treasure of a song with a great hook in the chorus. The fourth track is a cover of R.E.M. 's "Losing My Religion". It is well done and shows that Mr. Bailey has good taste (in 2013 he covered The Kink's "Waterloo Sunset", so it isn't an accident). The EP closes with the tongue in cheek "X-Factor Killing Spree". All in all, great stuff. And if you are on the fence, know that your purchase price will not allow Mr. Bailey to add to his fleet of Bentleys and Lear Jets, as all proceeds from sales of digital downloads and CDs will be donated to a non-profit raising awareness of and offering support to those affected by male suicide (a lot of Spurs fans will benefit from that, no doubt). Yoncalla, the first full album from New Zealand's Yumi Zouma is a box of jewels -- sparkling, well polished and perfectly cut. There is nothing gaudy or overboard, just restrained elegance; elegance born of delicate and pristine vocals, tasteful and well detailed production, and the kind of endearing melodies that keep prompting you to look at the clouds and think happy thoughts. 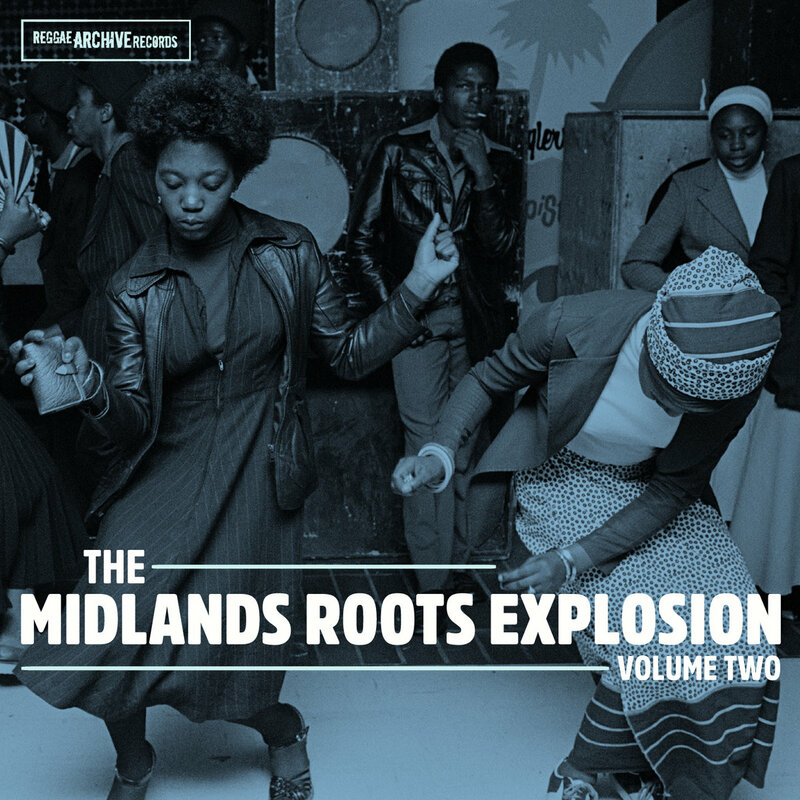 The arrangements are spacious and hooky, with a hint of bubbling lo-key disco, allowing the album to serve as a party track as well as a backdrop for lower key times. Possibly no track on Yoncalla will hit you in the face and scream "mega hit", although "Short Truth" and "Barricade" deserve to prove me wrong, and several other could have a long life on radio and playlists as well. Rather, they all will seep into your brain with repeated listens, becoming welcome new friends. Moreover, the band has used their long buildup to their first album well, creating a set of songs that is consistent and high quality. Shimmering pop with not duds -- this album is a winner! Yoncalla is released today, May 27, via Cascine, Arch Hill (Australia/New Zealand), Rallye (Japan) and Double Deer (Indonesia). Australian band Methyl Ethel. The album is getting it's worldwide rollout via 4AD. We will have more on the album later, but we didn't want to delay in bringing you the video. One of my top discoveries of 2014 was Brooklyn's Pale Lights, and their LP from that year, Before There Were Pictures, was on of my top thirty albums of 2014 (link). What makes that band so special? In my view they craft perfect guitar pop/jangle pop that touch on the best influences without mere imitation. The hooks are plentiful, the vocals robust and the sound has the polish of the guitar pop bands whose work lingers longest in the memory of fans, such as Lloyd Cole and the Commotions, The Go-Betweens and Orange Juice. And with that background, I'm happy to report that the band is preparing a new album, and even happier that because they know how impatient we are, they have released a four-song EP to keep us satisfied until the LP is ready. Titled Seance For Something, the record has four varied pop gems that demonstrate the crew's mastery of guitar pop. The opening "Mother Cries" evokes The Bats and Rattlesnakes-era Lloyd Cole, in the latter instance due in no small part to frontman and songwriter Phil Sutton's vocal similarities to Mr. Cole. I think it is the best song on the EP, but the points are close on my scorecard. The following "Girl In The Park" and "Alone In This Room" bring to mind the heart-tugging and bittersweet gems from The Go-Betweens and The Lucksmiths. The EP closes with "Sweetheart", which sounds like The Bats with an added element of '60s California country rock. The songs are substantial and varied, and show Pale Lights to be one of the top level guitar pop bands on the scene. The band are Philip Sutton (vocals/guitar), Andy Adler (lead guitar), Maria Pace (bass), and Lisa Goldstein (drums). In addition, Kyle Foster played keys and sax, Suzanne Nienaber provided harmonies, Hamish Kilgour hit the tambourine on the opening track and recording engineer Gary Olson provided piano on that same song. Seance For Something is out now via Calico Cat Records. See the Bandcamp link below for details, but I'll note that at $3, the digital is a bargain. Leeds, UK has a storied history in electronic music. One of the best bands of the current generation are Vessels. Comprised of Lee J. Malcolm, Martin Teff, Tim Mitchell, Tom Evans, and Peter Wright, they are quite happy to blow your mind, and quite capable of doing so as well. I first played their new single "Are You Trending?" an hour ago and I am yet suffering the effects of shock and awe. Once you've made an attempt to get your head around that bomb, try the slower building but still sizzling "4AM". Somewhat surprisingly given their current sound, the band originally played post rock, but with the 2015 release of Dilate, they carved out prime territory in the electronic space. When I started writing for this blog one of my goals was to help let the world know about the wealth of quality pop music put out by the residents of Scotland. I have never regretted that decision as each year has brought plentiful pop joys in multiple genres. Today I'm here to proclaim the virtues of an Cowardly Deeds by Glasgow's Randolf's Leap. Quite simply this album, and the band that created it, are a prime exhibit for the quality of the Scottish music scene. The melodies are bright, hook-laden and memorable, and they are adorned not only with the usual compliment of guitars, bass and drums, but also with keys, string and brass. Yes, having eight people in a band brings rewards to the arrangements even if it complicates voting where to go for dinner. The lyrics are literate, clever and thoughtful. As a vocalist, frontman and songwriter Adam Ross is sincere and convincing. And overall, the performance of the band is energetic enough to make it clear that this band really, really likes what they are doing. Nor is Cowardly Deeds all joyously uptempo. The band provides an good measure of more reflective tunes, providing nuanced and restrained background for Ross' musing on life's uncertainties. Randolf's Leap's earlier recordings took the lo-fi, bedroom recording approach. But this album has higher production values, and the results are well worth the extra time and effort. Combined with the skilled contribution from the band and Ross' talents for penning well-considered comments and them dressing them up in bright pop wrappings, this is one of the better bands Scotland has to offer, and Cowardly Deeds is a worthy calling card. The band are Adam Ross (guitar/vocals), Adam Florence (drums), Vicki Cole (bass), Andrew MacLellan (guitar), Heather Fox (violin), Pete MacDonald (keyboards), Ali Hendry (trumpet) and Fraser Gibson (trombone). Cowardly Deeds is out now via Glasgow's Olive Grove Records. One source to purchase would be the Olive Grove Bandcamp page which is linked at the bottom of this post. Exploded View is a multinational band working with Krautrock, dub, electronic modes of musical expression. Fronted by UK-born and Berlin-based former political journalist Annika Henderson (vocals/synth), the band includes Martin Thulin (drums/guitar) from Sweden, and Hugo Quezada (bass/synth) and Hector Melgarejo (synth/guitar) from Mexico. All of the members have participated in other well-regarded projects, and we expect exciting sounds from this collaboration. Two tracks, "Orlando" and the previously released "No More Parties In The Attic" are out now. The band's self-titled album will be out in August via Sacred Bones. Melbourne's Glaciers have been tantalizing us for several years with the occasional demo or single. If it has meant to tease us, it has worked as planned, as our interest is keen. We finally have the good news that June will bring Living Right, the four-piece's first LP. The band will be addressing the challenges of growing into adulthood, swathed in the dreamy jangle and well-crafted melodies we expect. Two songs from the album -- "Local Hero" and "Career Crisis" -- will give you a taste of the ace tunes that Glaciers can craft. Glaciers are Nalin Dayawansa (vocals/guitar), Simon Crouch (vocals/guitar), Ryand DeCoite (bass), and Tom Coish (Drums). 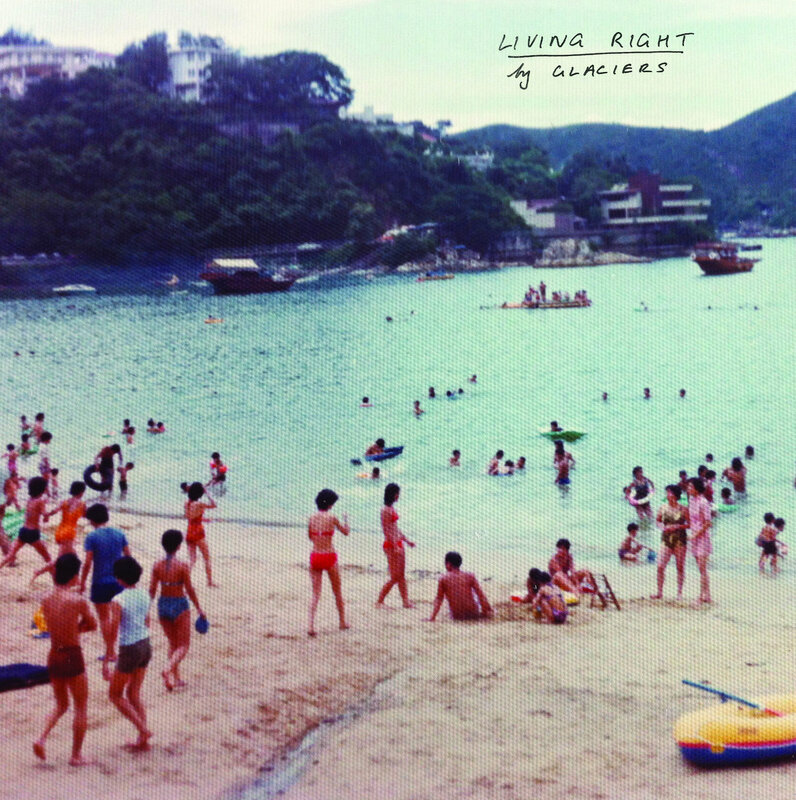 Living Right will be released on vinyl and digital by Strong Dogs Records. A cassette version will be available via Easy Summer.